Acacia fimbriata is known as the Fringed Wattle because of the microscopic hairs along the phyllodes. 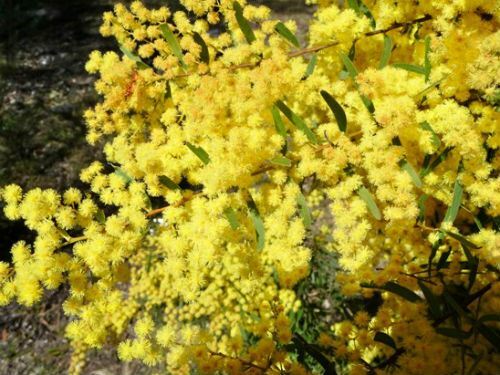 The Fringed Wattle develops into a bushy shrub and if left unpruned will reach the height of a small tree. We prune our specimens annually to keep them bushy, at tall shrub height and flowering profusely. The phyllodes are thin, linear and light green. In spring plants are covered with pale yellow, perfumed flowers. Growth habit, foliage and flowers are all attractive features. Acacia fimbriata has proved to be frost tolerant and drought resistant in our cold climate garden. 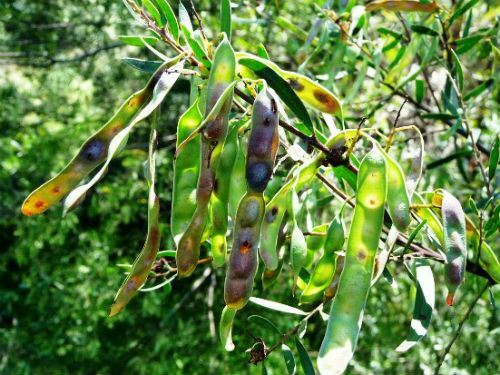 The species is widely cultivated and occurs naturally in eastern NSW and southern Queensland. It is also said to tolerant damp conditions. There are also attractive dwarf cultivars. One is known as ‘Crimson Blush’ and has bronze tipped foliage. The specimen chosen for the type was collected by Alan Cunningham in southern Queensland in 1832. Propagate the ‘normal’ form from seed and cuttings. The dwarf forms must be propagated from cuttings to maintain the desirable growth habit.